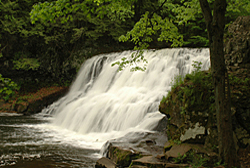 Wadsworth Falls State Park features two trailside waterfalls. Both are easily accessible by bike via multi-use trails. Wadsworth Falls : Height: 30-ft.
Wadsworth Falls on the Coginchaug River can be accessed along the family-friendly, wide orange-blazed Main Trail. This impressive falls has one of the largest water flows in the state. 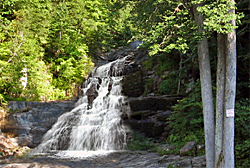 Little Falls, on Wadsworth Brook, can be viewed from the rugged, blue-blazed Little Falls Trail. This intermediate trail descends into a ravine to the base of the falls where the brook cascades over a series of stepped brownstone ledges. Chapman Falls : Height - 60 ft. Almost all the trails within the Devils Hopyard State Park 15-mile multi-use trail system are available for mountain biking, UNLESS posted otherwise. The trails traverse the park through a varied habit of hemlock forest and wetlands at times veering close to the Eight Mile River for views of the falls. Most of the mountain bike riding is challenging with technical, rocky climbs and descents, jumps and hike-a-bike sections. There are a few easier trails for beginners and intermediate level riders. Directions: From I-91S: take Exit 22 for Route 9 South, Exit 7. Take a left at the end of the exit ramp onto CT Route 82 east/154 north. Take a right at the first traffic light following CT Route 82 east and follow the signs. Although there are no mountain bike trails at Kent Falls State Park, one of our featured mountain bike rides is located about fifteen minutes away. After a morning of mountain biking the Mohawk Mountain State Forest Trails, head on over to Kent Falls State Park for a picnic and a short hike up one of Connecticut’s most photogenic waterfalls. Kent Falls is a series of falls on Falls Brook that cascade down about 250 feet in just .25 of a mile on the way to rendevous with the Housatonic River. A steep .25 mile foot trail with lookouts at three scenic vantage points leads up alongside the falls to the top. The flow is good at all times of the year, especially in the Spring or after a period of heavy rain. Miles and miles of dirt roads and trails traverse the Arcadia Wildlife Management Area and lead to scenic ponds and the Stepstone Falls. What the Stepstone Falls lack in drama, they make up for in interesting rock formations and a lovely peaceful setting. Situated on the Fall River, the water cascades gracefully over a series of broad stepped ledges. Interesting chisled rock sculptures indicate that this area used to be a quarry. It's a nice spot for lunch. By Car from Interstate 95: Exit 5A in Rhode Island to Route 102. Head east 0.6 mile and veer right onto Route 3; south for 1.25 miles and right turn onto Route 165. West for 5.3 miles; right turn onto onto Escoheag Road. Travel north 2.4 miles; right turn onto the dirt Falls River Road. Look for the Stepstone Falls parking about 0.6 miles away at a small concrete bridge. This dramatic rock canyon with 70-foot-high walls was carved by glacier action and rushing water from the Westfield River. During the spring, the snowmelt from the surrounding Berkshires cascades along the river and rushes through the Gorge, tumbling over boulders and rock ledges. A half-mile walking trail along the cliff tops offer astounding views of the gorge, the river, and the surrounding forest. From the gorge, River Road, an old dirt and gravel jeep path open to mountain biking, hiking, cross country skiing, snowshoeing (no motorized use permitted) runs for 9 miles along the Westfield River through Massachusetts largest wilderness area. Along the way are waterfalls, swimming holes, abundant wildlife, state parks and historic eveidence of early farming and industry along the river.